​​We are your source for anything with a logo on it, including promotional items, apparel, and commercial print. The Bywater difference begins with our focus on what our clients are trying to achieve and not the product they are looking to buy. Our unique problem-solving method - Evaluate, Innovate, Execute! - allows us to deliver solutions on time and within budget, no matter your goal. We develop custom sites that enable our clients to simplify and manage their purchasing process and protect their brand and budget. Take a look at some of the clients we’ve partnered with below (or go to our toolbox to see specific items) and see what we can do for you! We’ve been partnered with the St Paul Saints baseball team for three years and we really enjoy the chance to work with a local team. When they planned to break a world record of the most people squatting at a time, they came to us looking for a unique give-away item. ​We created unique sweatbands that were given to participants at the event. These ended up being a unique item that fit the event well and people could use, while staying within the event’s budget. A local government went through a rebranding and needed to make sure that every point of contact was consistent for taxpayers. They also employed hundreds of people and faced the challenge of managing the brand through each department. We built them a website where each employee could easily access the branded products they needed. By having all of these purchases on one central website, employees could easily order what they needed and the county was confident that the brand message would be clear. When the Baseball Card Roadshows needed to set up a booth for a national tradeshow they came to us for ideas on marketing. It was important for the booth be memorable among the many others at the show, we were able to help them through the whole process and create a display that showed their brand efficiently. ​We created a marketing strategy for them to use at the booth and did all of the design work needed to create the marketing pieces. We ended up being a one-stop shop and helped them pull off a successful display with a tent, banners, table cloths, contest entry form and postcards. When a large insurance company came to us looking to reach their market more effectively, we knew that the promotional items had to be unique. Austin Mutual had a budget to stick to and a target market it wanted to reach. ​We brainstormed some innovative ideas with them and made sure to stick to budget. We did the design work for the project and ended up creating some memorable items such as branded fire extinguishers and toy monkeys. These unique items were sure to catch customers’ attention. A local start-up in the birthing industry has been experiencing rapid growth and quickly needed all of the materials for an upcoming event. Enlightened Mama came to us two days prior to the event needing design and print work. ​We were able to dedicate time to this client immediately to get the brochures designed on a Thursday and printed the next day for an event that Saturday. Our relationship with our local print partner allowed us to get everything made quickly and we delivered the next day. Situations like this are why we enjoy the chance to work with startups. Local businesses were struggling to maintain sales during construction of the green line. Businesses in the Stadium Village Commercial Association saw a large drop in sales and needed to find a way to keep up business during construction. We helped this group of businesses come up with a strategy for marketing the area. They used us for design work, promotional items, and social media. We even helped them put together a large event, and today the stadium village area is reporting increases in revenue and traffic. 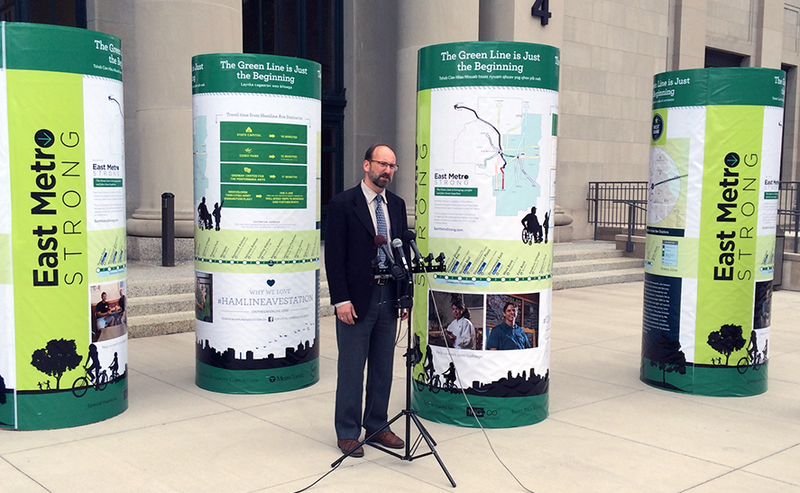 ​During the opening of the Green Line, East Metro Strong needed a unique way to display information about the project and their brand. Being a one-time event, the marketing needed to be mobile, but also large enough to make an impression. ​We created a solution for the opening event that allowed people to learn a lot about the Green Line while also providing a strong brand presence throughout. These mobile kiosks ended up being a great way to solve the unique situation of East Metro Strong and was an opportunity for us to create an innovative product. Our business spans several industries, but we like to consider ourselves specialists in helping people attract, retain, and grow the stakeholders in their organization. Get in touch and we can do the same for you!